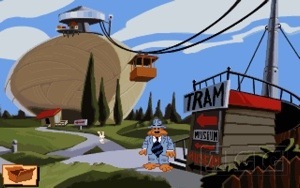 Sleep evades me yet again, so I am lying on the bed, slightly jittery yet happily reminiscing about playing the Sam & Max PC game – specifically the part in The World’s Largest Ball Of Twine. I have no idea why, except perhaps that it was so deeply, deliciously odd and amusing. Much like the game itself. 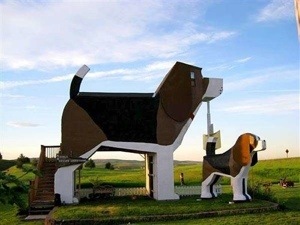 This then led me to wishing I could travel the world visiting bizarre landmarks and staying in The World’s Largest Beagle (for example). The toilet is located in a building designed as a fire hydrant, apparently. Of course it is, why would it not be? 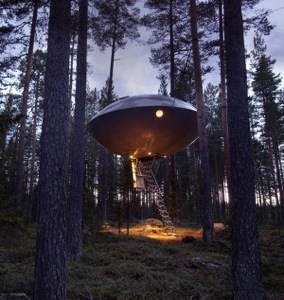 It has long been an ambition of mine to visit the awe-inspiring UFO Hotel in Switzerland (now THERE are some holiday snaps people would be genuinely interested in looking at). 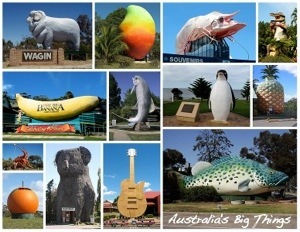 Of course, when talking about the subject of Oddness Writ Large, you cannot help but wish to see all of Australia’s Big Things (though they’d have to turn the heating down for me and rid the place of large insects), famously written about by Bill Bryson and gawped at by countless thousands, I shouldn’t wonder.